A convenient lodging location to Heavenly, South Lake Tahoe as well as historic Genoa and Nevada City, the Historian Inn was built in 2000 with all the modern conveniences, yet in line with the distinctive, classic architecture of the west and enriched with the colors, textures, and natural materials of Nevada, the Sierra Nevada and reminiscent of the gold rush. 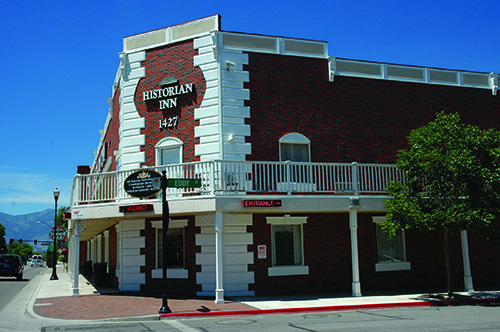 The Historian Inn celebrates the rich legacy of the American frontier and offers a glimpse into the spirit of the West. The Historian Inn has recently completed a room by room renovation to reflect the heritage of the past. With historic artwork, photography and artifacts blended with custom-designed furniture, wood floors, and bed coverings to create a comfortable, contemporary and high-style décor with western influence. This Lake Tahoe Base Camp is conveniently located on Highway 395 on Historic Main Street Gardnerville, our Carson Valley Hotel is across the street from the J.T. Basque Restaurant and Bar and surrounded by shopping and dining, as well as serene walking paths and parks. The perfect location for a place to stay one night, wedding hotel or a home base to explore the region.